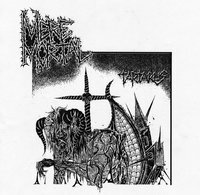 Static Shock Records - MERE MORTAL - Tartarus 12"
MERE MORTAL have arrived! With members hailing from various parts of England, their debut MLP Tartarus, harkens back to the raw sound and atmosphere of the often under-rated UK Thrash Metal scene, with many listeners noticing a distinct similarity in vocalist Liam Fox's approach to that of Benediction-era Barney Greenway, as well as Bolt Thrower's beloved Karl Willetts. Permeated with the darkness, intensity and authority of those forbearers, Fox conjures images of apocalyptic death and despair, leading the charge of MERE MORTAL's thrash assault. Behind him bassist Tom Pimlott, drummer Adam Rogers, and guitarists Maegan Brooks and Joe Sam Williams charge ahead with a sound that remains equally close to the UK - evoking memories of bands like Virus, Sabbat, Hellbastard, and Sacrilege. Like so many of their progenitors, the members of MERE MORTAL began their musical journeys in the punk scene, and that level of urgency and directness is able to inform their approach to Tartarus, with songs kept brief, direct, and precise. MERE MORTAL's Tartarus is a fine tuned and deadly sharp assault on the once again thriving thrash metal scene. Limited to 300 copies on ice blue vinyl.